A payment receipt is a piece of tangible evidence that proves that the specific amount of payment has been made in exchange for goods or services. In general, the payment receipts are used whenever there is a transaction of money being conducted. The basic purpose of the payment receipts is to notify both parties about the successful exchange of services with the money. Since the payment receipts are used in almost every organization, the educational institutes also use them to keep a proof of payment. 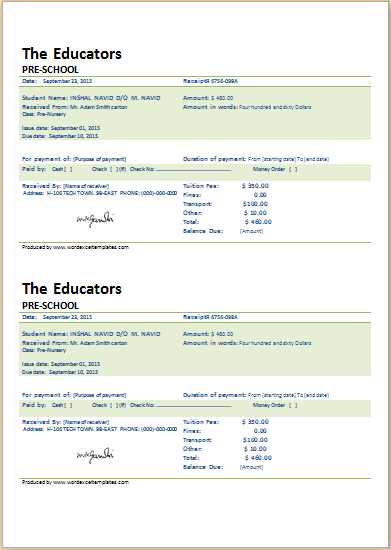 The school fee payment receipt is given to the parents or guardians of the child to request for the fee they are liable to pay. A fee receipt is of two kinds one for an educational institution e.g a school or college and second for services rendered by a consultancy company e.g legal or medical. Both kinds of fee receipts are different. The purpose however for these receipts is the same and that is charging money for specified services and record keeping after payment deposited against those charges. For school and educational institutions additional information like the roll number of the student, name of the student, grade or standard the student is studying in, the section of the grade, the name of the courses taken by the student, security fee, annual charges, cafeteria charges, transportation fee, the name of the months the fee is charged for, the due date of the fee deposit, the penalty charges in case of late fee payment, special facilities charges etc are also included. The school fee payment receipt is signed and stamped by the person dispatching it. It is also signed by the person who deposits the fee according to the mode of payment specified. A fee payment receipt template fulfill all the general requirements however it can be altered a bit and made customized to fit requirements as well. How to create the school fee payment receipt? Enter the name of the student, student’s grade, the name of parents, the month of the fee, the total amount of fee to be paid, terms and conditions such as due date, fine after the due date and a lot more. Also, mention it in the fee payment receipt that the fee to be paid is for how much duration as there are some schools that send the payment receipt on a quarterly basis. 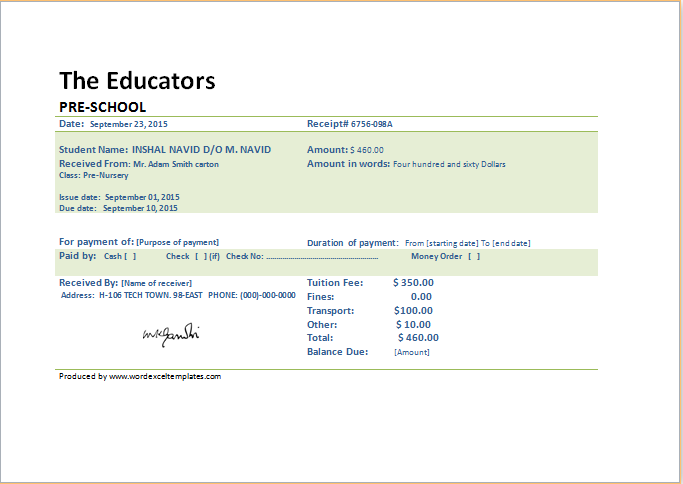 The school fee payment receipt template is created in MS Excel format. This template eases the process of fee calculation. Many schools prefer using the school fee payment because it is error free and speeds up the process of fee calculation. The name of school, child, grade and some other details are required to be changed before printing this readymade template.